Last week I went to give a demonstration of pastel painting to the ladies of the WI at Tanworth-in-Arden in Warwickshire, and to tell them about my work as a wildlife artist. What a beautiful picturesque village Tanworth is, and the WI were a very interested group. I drew a peacock for them, which I saw a while ago at Bradgate Park near Leicester in mid-October. With no spectacular tail to display, he still made a wonderfully colourful sight. 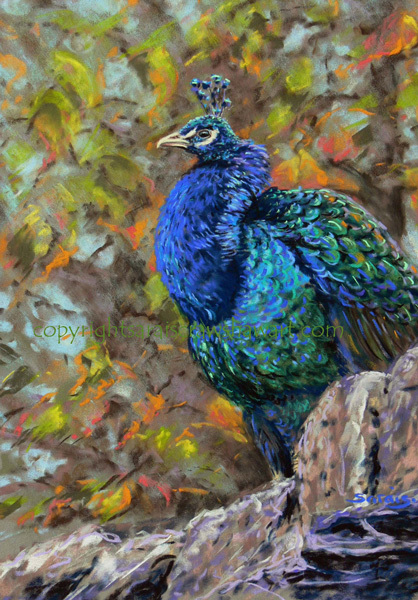 The peacock was posing on a wall in front of some beautifully colourful leaves, making a zingy contrast with the blues and greens of the feathers. On the evening, I didn't have time to do more than indicate how the picture would develop, but it seemed to be appreciated. I took another couple of hours later to tighten up the drawing a little before I was pleased with the result.